I have had a wonderful journey at CUD. I definitely gained a lot, both in terms of education as well as some fun memories. The e-Business course was a very rare opportunity in Dubai, and I feel grateful to CUD for offering this program. The teachers are great and very supportive to all students. The facilities provided for students, both for educational and extracurricular activities, are excellent. I will definitely recommend CUD to everyone. The Interior Design major offered me the opportunity to combine my love of art and science in one degree. I chose Canadian University Dubai because of its Canadian connections and have been impressed by the quality of the program, which is both interesting and challenging. The University also offers an excellent extra-curricular program, with everything from sports events and student trips to course-related competitions, providing a good balance between social and academic activities. Working in the waste management department at Dubai Municipality, I am responsible for all of the treatment systems and for supervising the companies operating in the field of waste treatment and material recovery. I was motivated to take the Environmental Health Management program to acquire the skills to support the development and sustainability of Dubai through my profession. CUD provided me with a unique and outstanding learning experience that taught me all the theories and principles to succeed in my career. 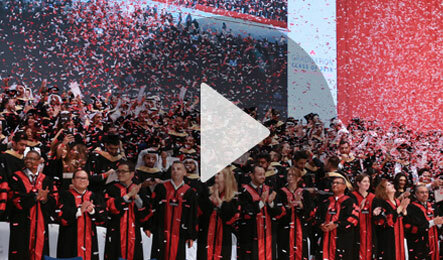 It is one of the top tier universities, not only in Dubai, but across the region. After completing my Computer and Information Technology studies in 2010, it was time to think about my MBA! After searching and asking about the best place to invest in, my friends advised me to join CUD because of its well-known reputation. So I visited CUD to get more familiar with the standards, the level of education and its quality, and felt really comfortable with them, so I joined the program in 2010. I found the experienced faculty members had both field and educational experience, and the lovely environment that included a mixture of nationalities, was a great opportunity to exchange cultures and experiences with other students. Classmates and competent professors made the education an unforgettable experience. Besides that, I could always count on the great support from the CUD Deans and the Faculty members. I’m really proud to be one of the CUDs MBA Graduate students, and to have learnt such valuable information really helps me in my field of expertise, whilst gaining many friends from different parts of the globe. Lastly, I want to say a big thank you to the entire faculty who supported my education. The MBA at CUD delivers both theoretical and practical insights into how business works at a strategic level. For me, it provided some very important lessons, like the difference between being a manager and a leader, and how to apply best practice in everything I do. Learning and networking among professionals from a range of different backgrounds enriched the whole experience and the professors were a great source of inspiration, posing challenging questions, while keeping us firmly focused on our career goals. The flexible program schedule was particularly value for me, as working alongside my studies gave me the opportunity to implement what I had learnt as I progress through the program. I chose to study HRM because I am fascinated by people and want to learn and understand more about how to work with different personalities. The faculty members at CUD have been a real inspiration to me; they have extensive expertise of their subject areas and teach us about the latest industry practices, as well as the theories we need to know to apply them. They have always encouraged me to set goals and motivated me to succeed. My next step is to study for a Master of Business Administration degree at CUD, after which I hope to work in the HR profession, helping to develop new tools and techniques that change the way traditional HR processes work. Working directly with the Institute’s managing director, I am responsible for research projects related to analyzing Arab affairs from a media, sociological, and an international relations theory perspective. While my studies at CUD mainly focused upon media and advertising, I was also introduced to politics and international relations theory, and with inspiration and support from my professors, I was able to explore other fields such as sociology and psychology. CUD helped me realise that modern challenges require interdisciplinary skills, and commitment from the people of my generation to work together in search of solutions. I was able to explore new ideas through class discussions and projects, giving me the motivation to write and think of my own research projects. With my professors’ support, a close group of friends, and freedom of exploration through my coursework, I was able to grab this career opportunity. عملية البحث عن جامعة مناسبة لم تكن بالأمر السهل خاصة عندما يتعلق الأمر بوجود عمل وارتباطات أسرية، إلا أن الجامعة الكندية كانت الخيار الأنسب لي لما توفره من مرونة في توقيت المحاضرات ودعم الكادر التعليمي مما ساعدني على إدارة عملي ومتابعة حياتي الخاصة دون أية تعقيدات. الجامعة الكندية جمعت وبكل المعايير الخبرات العالمية والبيئة المثالية للتعليم تحت سقف واحد. حاليا ً أنوي الالتحاق ببرنامج الماجستير في إدارة الموارد البشرية في كندا. بكالوريوس الآداب في الاتصال- العلاقات العامة من الصعب على الطالب إختيار او إيجاد جامعة متميزة وسط هذا الكم الهائل من الجامعات في دولة الامارات العربية المتحدة , إخترت الجامعه الكندية دبي لسببين الأول هو موقعها المميز وسط إمارة دبي ثانياً لأنها بوابة تعزز وجهات النظر الكندية في البحث والتعليم والتطبيق كما أنها تركز على تقدير وإحترام ثقافة وقيم دولة الامارات العربية المتحدة , بما توفره لطلابها من كادراً وظيفياً وتعليمياً يكتسب من الخبرة العالمية والثقافة المرنة في التعامل مع هذا الكم من الثقافات التي ينحذر منها طلابها.